Deciding to embed business analytics into your application will fundamentally shift your product strategy and execution plan. During this webinar, will discuss the three perspectives of the strategic, business and product teams as they come together to make a decision that will shape the success of their product. There’s no denying that 2017 saw an explosion of growth for analytics. But, as enterprise organizations require greater productivity and lower cost, how can analytics evolve in 2018 to meet those demands? Join Martin Butler, Founder of Butler Analytics, and Evan Castle, Sisense Product Manager, as they dive into the “three I’s” - intelligence, integration, and interface - and how they’ll change the enterprise analytics game in the coming year. Join us for the next webinar in the Bright Talk series of Advanced Analytics where we will discuss the future of advanced analytics, and how it can be shaped for everyone, regardless of technical expertise. •Advanced Analytics - how far away are we? Save your place in the future now. Effective decision makers blend experience and instinct with supporting data. The strategic alignment of analytical capabilities and clean, usable data makes that possible. Natural language generation (NLG) and search-driven analytics are just a few of the new technologies companies are using to connect their most potent business minds with the right data. In this webinar, we’ll explore how you can leverage NLG to enhance business performance. Business Intelligence is hitting a crossroads. On the one hand, data is getting bigger and more complex while on the other hand more business users, without analytics backgrounds, are demanding the keys to the kingdom. By utilizing analytics BI shifts into the organization’s DNA, laying the foundation for creating a true data-driven company. Join guest speaker, Martha Bennett, Forrester Principal Analyst, and Ani Manian, Head of Product Strategy at Sisense as they explore market trends and share their insights on how to navigate rising expectations and data complexity, towards integrating data as a core part of your company’s culture. You’ve probably heard both IoT and the Cloud are great ways to leverage powerful BI and get better and faster insights, increase efficiencies across your organization, and align departments around their goals. But how can you actually implement in a meaningful way? In this webinar join Ani Manian, Sisense’s Head of Product Strategy, and Aaron Hayes, Senior Software Architect at Premium Retail Services, as they discuss how you can bring your data beyond the screen and to the cloud. See first hand how Premium Retail Services uses Amazon’s Alexa for a competitive edge, and what to look for - and avoid - when pushing your organization to become even more data-driven. Join Martin Butler, Founder of Butler Analytics, and Adam Blau, Account Executive at Sisense, as they discuss the best way to go about evaluating your BI software down to the smallest details, including a selection template for supplier, functionality, architecture, and administration. Follow their steps and take your business to the next level. Machine learning can identify patterns that humans tend to overlook or can’t find easily in masses of data. Organizations have begun to notice that by using machine learning, they are able to make new discoveries, as well as identify and solve issues faster, gaining the competitive edge over their competition. Join Boaz Farkash, Sisense Head of Product Management and Philip Lima, Mashey’s CEO, as they explore how Machine Learning is unlocking the power of Business Intelligence. - How Smart Can One Machine Be? Businesses today already know that visualization in business intelligence is an essential part of competitive success. Yet, too many organizations are falling behind because of the inability to keep up with demand for information. One mistake is thinking that self-serve data visualization is all they need when setting up a self-service BI environment. Debunking the common myth, we will explore why data visualization IS NOT self-service BI. The only way for Information workers to become more self-sufficient is by having a BI environment that is more usable but also more consumable. It is these two themes—usability and consumability - that play crucial roles in a fully functioning self-service BI environment. Using modern IoT technologies, the modern business can expand access and consumability of data by engaging the human senses of sight, sound, and touch. Join Lee Hermon, Sisense Engagement Manager, as he explores the limitations of current Self Service Visualization models and Adi Azaria, Sisense co-founder & Chief Evangelist as he introduces how IoT in Business Intelligence is changing the game. The data landscape is constantly evolving, and the proliferation of smart devices, machine learning, and embedded analytics promises to introduce many exciting new breakthroughs in business intelligence in 2017. Join our panel of thought leaders to discuss their predictions for BI in 2017. So you’ve decided you want to jump on the data analytics bandwagon and propel your company into the 21st century with better analytics, reporting and data visualization. But to get a BI project rolling you usually need the entire organization, or at the very least the entire department, to get on board. Since embarking on a BI initiative requires an investment of time and resources, convincing the relevant people in the company to take the leap is imperative. You’ll need to construct a solid business case, defend your budget request and prove the value BI can bring to your organization. In a world run on data, analytics has become a fundamental part of everything we do. Embedding widget-level analytics into apps, webpages and tools opens a world of product differentiation, greater product adoption, and improved user experience. But you don’t need a data warehouse or a ton of IT or BI resources to implement a best in class embedded analytics solution. With the right tools, you can build flexible data products that don’t require additional infrastructure costs or data prep. Organizations are growing their data environments up to 50% a year, in both size and scope. Yet only a fraction of this data is actually being translated into actionable insights and better decision making. So how do you achieve actionable insights from your BI? The “Old” world of BI, with its IT centric solutions, OLAP based reporting, and limited ad-hoc querying, has a lot of shortcomings that inhibit self-service BI. Yet, with increasing data complexity has come a new age of BI that is focused on taking strides to provide faster, more data driven and integrated solutions to try and empower the business user. Join Ani Manian, Head of Product Strategy at Sisense, as he explains the old and new trends in data analytics, and how you can make sure you benefit from a more business-centric world. You’ll learn how to set up meaningful KPI’s, model data according to specific business needs, and work interactively with business users to prototype relevant reports. Data exploration is the first step in data analysis and typically involves summarizing the main characteristics of a dataset. It is commonly conducted using visual analytics tools. Before a formal data analysis can be conducted, the analyst must know how many cases are in the dataset, what variables are included, how many missing observations there are and what general hypotheses the data is likely to support. An initial exploration of the dataset helps answer these questions by familiarizing analysts about the data with which they are working. Join Noam Engelberg as he walks you through the 5 best practices for Data Exploration in preparation for Data Modeling. Understanding data modeling can help you get the best insights out of your data. The challenge of data modeling is to understand how to work with complex data in order to standardize, structure and optimize data to gets accurate insights quickly. Learn how to use a growing library of R functions and advanced techniques for deeper statistical and predictive analysis. 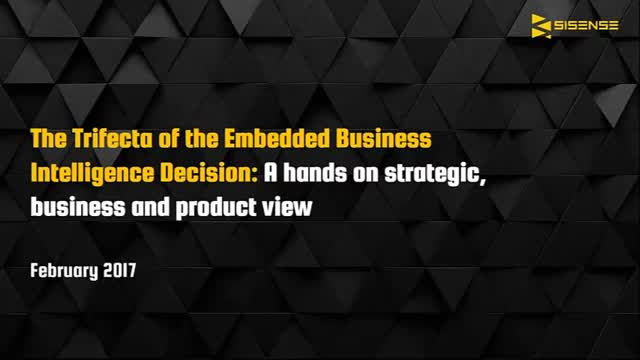 Join Jared Lander, the man behind "R for Everyone: Advanced Analytics and Graphics", and Evan Castle from Sisense as they illustrate how R can be used to solve real life business problems. Information optimization is a new focus in the business analytics market. Join Tony Cosentino, VP and Research Director with Ventana Research, as he outline the 3 best practices that will ensure your organization gains full value from its investments. Craig Aspinall will finish off by presenting the Jack Doheny Companies' Case Study on how creating a data-driven culture saved Jack Doheny Companies $120 million. Aberdeen’s research shows that the answer to complexity is simplicity. User-friendly analytics pave the path from data collection and preparation through to analysis and final presentation. Easy-to-use tools empower users with intuitive interfaces and mitigate the need for coding and IT assistance. This webinar will examine findings on users with the right tools to prepare, analyze, and visualize complex data and also showcase the analytical practices of Best-in-Class organizations (the top 20% of performers). Data environments are growing exponentially. Not only is there more data, but there are more data sources. At the same time, the value of unlocking that data and using it to make business decisions is also increasing. For the business user, understanding this complex data and unlocking its potential is the key to staying ahead of the competition. For IT organizations, complex data can be the bane of many business analytics programs, causing all kinds of trouble in data management and hindering system performance. Size of data and number of disparate data sources are two key drivers of complexity. The bigger the data, the more effort needed to query and store it. The more data sources (data tables) the more effort that is needed to prepare the data for analysis. The data complexity matrix describes data from both of these standpoints. Your data may be Simple, Diversified, Big, or Complex. When considering a Business Analytics program, different approaches are better suited for each data state. easily prepare and analyze big, disparate datasets.